When our Claim Check columns run in this space, we often distinguish between verifiable assertions of fact, and statements that are purely subjective or amount to advertising puffery and which are not subject to fact-checking. Political candidates, however, don’t always make that distinction, as evidenced by a letter from the campaign of Steve Obsitnik, challenger in the 4th Congressional District, objecting to a television ad run by incumbent Jim Himes. That sounds like the sort of statement open to plenty of debate, but not to proving wrong as a matter of fact. Regardless, Obsitnik’s demand is not likely to go anywhere. First, broadcasters who accept advertising for a federal campaign are barred by federal law from rejecting ads from a candidate, no matter what the spots contain. There’s not a lot News12 Connecticut is going to be able to do about content on Jim Himes’ website. All of which could lead one to believe that Obsitnik’s advertising objection was perhaps intended more as an advertisement of his own – and a low-cost one at that, assuming enough media outlets choose to write about it. First of all, that’s a trademark matter, not copyright, you goon. Second of all, assuming you’re trying to tie this to the President’s slogan, you don’t have standing to assert that anyway — the President does. If Obsitnik hires morons like this to run his show, he’s going to end up like Dan Debicella. 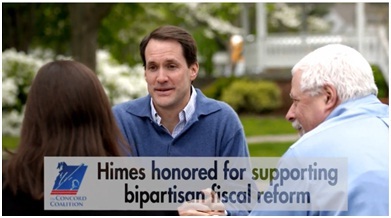 Giving an award to Jim Himes for deficit reduction is just like giving Barack Obama a Nobel Peace Prize. Democrats live in a bizzare world of make believe. They accomplish nothing but calamity and confusion. Why not award them a “Do Nothing” award? What’s next? A posthumous award to Adolf Hitler for being a friend to Israel? After all, nobody better contributed to the establishment of the modern state of Israel than Mr. Hitler, another national socialist. There should be a picture of Obsitnik next to “Chutzpah” and “hypocrisy” in the dictionary considering his campaign is refusing to withdraw ads from Cablevision and Comcast that contain my copyrighted footage. (See today’s story in Greenwich Post). Some candidates just have no imagination. And others just make things up. You completed certain nice points there. I did a search on the subject matter and found the majority of persons will agree with your blog. You could certainly see your enthusiasm within the paintings you write. The arena hopes for more passionate writers like you who aren’t afraid to mention how they believe. All the time follow your heart. Everything is that you simply legal offer which is enforceable to be found at law. But nonetheless , now the individual should but not worry. Hurrah! In the end I got a website from where I know how to actually get useful facts concerning my study and knowledge. Its superb as your other articles : D, appreciate it for putting up. “The real hero is always a hero by mistake he dreams of being an honest coward like everybody else.” by Umberto Eco.